Newport Beach, CA - July 26, 2018: Green Street Advisors adds three new components – Fiscal Health, Regulatory Barriers, and Desirability – to its drivers of quality grades for the top 50 U.S. markets. Green Street’s new market-level fiscal health scores assess the condition of state and local governments and identify the markets most at risk for higher taxes, reduced services, and outmigration. Long-term growth rates for markets in “critical condition,” such as Chicago and Northern New Jersey, are significantly lower than they would be otherwise. “Opportunities exist for investors to incorporate this threat into the market-selection process, as fiscal health doesn’t appear to be priced in to property market cap rates,” according to Andy McCulloch, Managing Director. Land use regulation is the primary impediment to new supply and a meaningful barrier that is difficult to measure. Green Street’s new regulatory framework, which considers the incentives and influence of residents and cities to restrict new development, helps investors anticipate supply growth well in advance of its impact on fundamentals. “Through this lens, New York’s regulatory environment screens as far less restrictive than conventional wisdom dictates, and West LA screens as by far the most restrictive market,” says McCulloch. Americans are moving South and West in search of opportunities, more temperate climates, and an overall better quality of life. While this is not new news to property investors, Green Street’s new Desirability scores provide a systematic way to assess the allure of various metros through the lens of millennial growth patterns, climate variation, and the general health of the population. California cities litter the list of most desirable places to live, but Austin, Texas garners the top spot in Green Street’s rankings. These proprietary metrics are part of enhanced Market Snapshot reports now available with Real Estate Analytics. 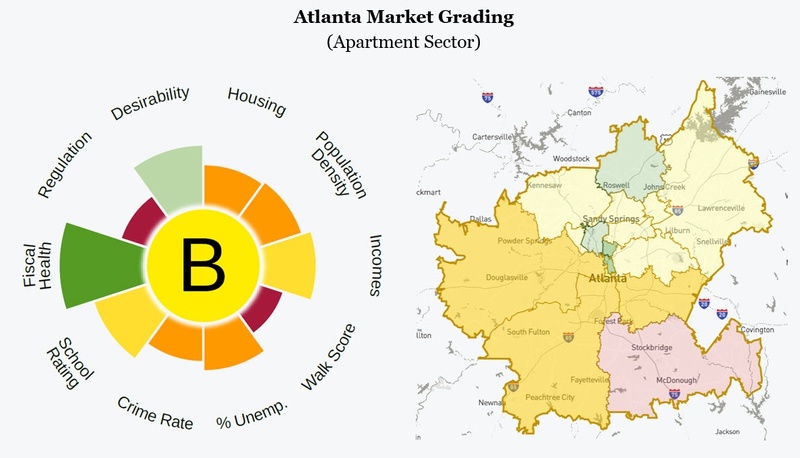 View sample Market Snapshot for Atlanta. In addition to market-level research, Green Street produces industry-leading strategic research on topics such as regulation and policy, demographics, technological disruptors, valuation, and more. Green Street’s commercial real estate research solution provides proprietary analytics and actionable intelligence to help private and public commercial real estate investors as they seek to make better investment and portfolio management decisions, mitigate risk, and raise capital more effectively. Green Street Atlas, Real Estate Analytics’ new mapping and analytics platform, enhances the product suite with even more market, submarket, zip code, and property-level visualization and data. Learn more at www.greenstreetadvisors.com/real-estate-analytics. Founded in 1985, Green Street Advisors is the preeminent independent research and advisory firm concentrating on the commercial real estate industry in North America and Europe. The company is a leading provider of real estate analytics, research, and data on both the listed and private markets. For additional information, please visit www.greenstreetadvisors.com.